One of the perks being on this side of 50 is having time to travel with friends. Every year, I try to take at least one trip with just my girlfriends. On occasion, my husband and I will take a trip with another couple. 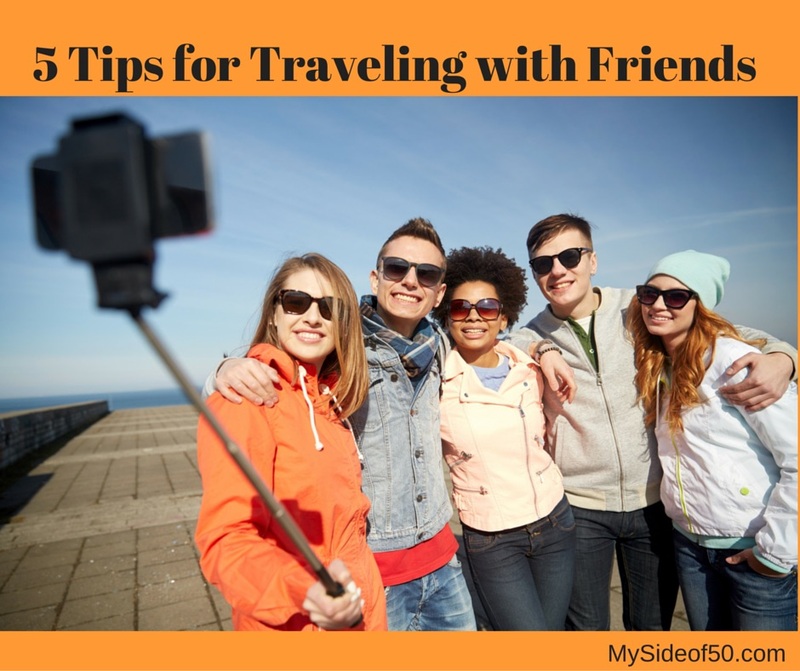 Here are some tips on traveling with friends that I have learned along the way that ensure everyone has fun together AND that you are still friends when the trip is over! Whether you like every minute planned or prefer a more “take it as it comes” approach, there are lots of things to research when planning a trip – airfare, car rental, accommodations, restaurants and sites to see. Make sure everyone in the group has an area to research then come together and make your plans. Some people, out of necessity or desire, travel on the tightest of shoe-string budgets. Others are able to spend extravagantly and not think a thing about it. These two vacationers should NOT travel together. There’s nothing worse than traveling with someone who is spending money on all the most expensive restaurants and experiences when you have to watch your budget. And vice versa, if you have the money to spend, it’s no fun having to scrimp on every little thing just because your fellow travelers can’t afford to travel in the style you prefer. In most restaurants you can get separate checks. But there are times on a trip when one person will cover the cost entire cost of something, such as a a tank of gas or tickets to an event. Appoint someone who is good at math to keep track of expenses and then tell everyone what they owe at the end. That way, everyone pays an equal share of the expenses. Even if you don’t mind picking up the tab for a cup of coffee or something that you think is small – document it. Those small charges can add up. And you may be with someone who feels the need to reciprocate, but really can’t afford it. There are lots of sites to see and things to do on a trip. But have the understanding that everyone doesn’t have to do everything with the group all the time. There will be different energy levels and different interests. As long as one person doesn’t inconvenience the entire group, be sure everyone knows that they have the freedom to go with the group or do their own thing. Even the best of friends can get tired of talking and being together all day. On a recent trip, we rented a house and each had our own bedroom, so it was easy to get a break from each other for a little while every day. Even if you don’t have your own rooms, plan time for a cup of coffee, a walk or just sitting in the hotel lobby by yourself for a while every day. A break will do everyone good and you’ll enjoy your time together all the more. Trips are a great time to get to know your friends better and grow closer as a result! I have so many great memories of trips with my friends. Keep these tips in mind and you’ll look forward to many more travels together! I enjoy traveling with friends, but making sure that you are compatible before you leave is very important. Spending time apart every day is a very good tip and also very important. Cramped hotel rooms, small cars can drive some people crazy. It’s been awhile since traveling with friends, but these are great tips to remember. Great idea for everyone to get some alone time! Thanks for these tips! Gigi – thanks for reading and commenting! I love traveling with friends, but really only get to do it during conferences. Still lots of fun, Estelle! I had so much fun and made new friends at BAMC! Some great suggestions, Cathy! I wonder if it would help to consider the introvert/extrovert combinations among friends who travel together. Your idea about allowing some private time is a good one for those of us who are introverts — we need that alone time to recharge. Thanks for sharing! Julie – I thought that very same thing as I was wrapping up the post. I am getting more and more introverted the older I get. I love socializing and being with my friends, but at a certain point, I just need quiet & solitude. Totally get it! I’m so pleased that you read my blog and commented! Thanks! These are great tips. I’ve learned that just because you’re good friends doesn’t mean you’re good traveling companions. This was so interesting to read. Family and friends can really be challenging to to travel with, and making some time to be alone is something I heartily subscribe to! I like the similar spending point Cathy saves many awkward situations. some great points here Cathy – especially in regard to people’s budgets. It’s really difficult being with people who have an unlimited amount to spend and you’re trying to keep things fairly tight – travelling with like minded (and budgeted) friends is definitely the way to go. This is such a good subject Cathy. We are going on a road trip with friends in July. We have never travelled with friends before apart from conferences. This trip is for pleasure and I have found your tips very helpful. We need to try and talk about these things before we set out. Thanks again for the useful tips. These are great tips. Sometimes the best of friends does not mean good travel friends. I love traveling at this point in my life. My family has usually taken a vacation at least once a year for as long as I can remember. It’s so much easier now that the kids are no longer at home, we can plan a vacation with friends spur of the moment and not have to worry about school schedules and packing the entire house. Such great tips. We love to travel with friends now. There is a delicate balance that seems to happen organically if you know the folks well. I think you comment that everyone doesn’t have to do everything together all the time, is so important. Thanks for the wonderful tips! I have one friend like that, and frankly, when she makes all the plans, I LOVE it. She’s so good at it. Sharing dinner prep is also good and with a beach house there is usually plenty of space. But you are right, there are always other issues to work out in a group. Thanks for reading and commenting! Thanks for reading and commenting, Christina. Glad you found the post helpful. Looks like every one had a great time. Traveling with people who have similar budgets is huge! Prevents a lot of frustration for all. It sure is – probably one of the most important things. If not, it can create a lot of stress and who needs that on vacation! Thanks for reading and commenting, Brenda. Great post. I actually have never traveled with a group of friends, only one other friend or with family. You shared some really good info, things I would never think about. Thanks, Celeste. I didn’t travel much with friends until I became an empty nester – one of the perks! One of the reasons I like all-inclusive vacations is that it reduces the money issues among friends. Of course, it only works if you invite friends that can afford the all-inclusive, but after that it is easy! I also agree that just because you travel together doesn’t mean you have to do ALL the activities together! If you want to read a book, while I play volleyball, then that is fine. Good point about all inclusive vacations, Bill. That’s one reason that I like to do cruises when traveling with others. Thanks for reading and commenting. Some great tips here. I think the best one is that not everyone has to do everything together. If we go away in a big group sometimes my other half and I go out for a dinner just the two of us. A funny moment when on holiday with friends, we were horrified to find out the bathroom door was see through glass. Who thought that was a good idea in a twin room! Oh my goodness – well that makes for a laugh for many years to come. Talk about getting to know your friends better! Getting away for a dinner alone is a good idea. Thanks for reading and commenting, Sally! These are all great tips! I definitely think making sure everyone is on the same page with spending and with the activities is so huge. We made the big mistake once of not really finding the “goal” of the vacation when we traveled with friends and as a result spent alot of money on a vacation that was not fit for us. Lesson learned! Yes, some of those lessons were learned the hard way! And the vacation was NOT relaxing! My daughter is embarking on mini trips with cousins and friends. This is perfect for her/them. My personal favorite part is having a lil solo time. Truly believe having THAT makes the ‘together’ time that much more fun. Yes, knowing what to communicate about and talking about it BEFORE the help helps manage expectations. Good to start ’em young! Thanks for reading and commenting, Lisa! I haven’t had the opportunity to travel with any friends for a long time. Not sure if I will in the future, but this is definitely a great, very well-organized list . Thanks so much! I appreciate you reading and commenting! Nikki – I am getting hooked on VRBO. With the price of hotel rooms and eating out every meal, I find VRBO to be very economical and you have so much more room. Great option for traveling with friends or extended family. Great ideas for traveling with friends. Glad you thought so, Bev! Thanks for reading and commenting! It is always so nice to travel with friends and family. Looks like you are having so much fun. It’s been a great year of travel, but I’m ready to be home for a while! Outstanding Tips dear! I am glad to find it. Jasmine – glad you found them helpful! This one is for my hubby and I as we ride our Harley with other couples a lot. Rebecca – that sounds like fun! If everyone has the same expectations and communicates ahead of time, things go much smoother! Glad you enjoyed the post! Great tips Cathy! Especially, everyone doesn’t have to do everything together. I love going with people that like to do things on their own. Yes – it’s always good to get a little space! These are great tips for traveling with friends and coming back home still being friends with everyone — ha-ha. Thank you for linking up at The Blogger’s Pit Stop. I’m sharing your link on social media. Mimi – I have some great friends who I love to socialize with – a day or evening at a time. But TRAVEL with them – no way!Thanks for reading and sharing! Thanks for linking up these great travel tips with us Cathy at #BloggersPitStop. I like the idea of appointing someone to keep track of the expenses. I’ve shared on social media and hope you link up next week. Wonderful post. 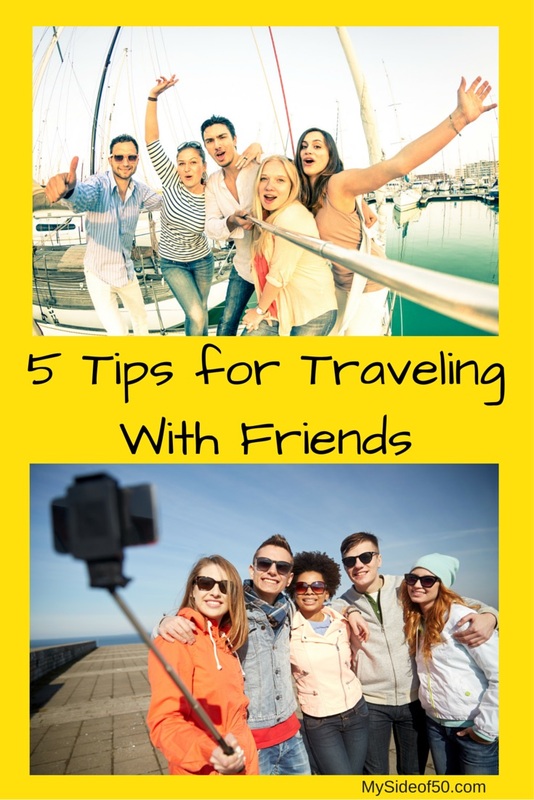 These tips are really important to keep in mind when plan a trip with friends.. I like the most in which you said that go with friends who spend like you. This way there will be no confusuions. Thanks for such greatful ideas. Yes – when you travel with people who DON’T have similar spending styles, that’s a recipe for all kinds of conflict. Great advice Cathy, and timely. I am preparing to go on a girls trip. We’re past the point of tips 1 & 2, but I will definitely implement 3-5. Thanks for sharing. I found you on Blogger’s Pit Stop. Have a fun trip Christie! I hope the tips help. My friends and I still take a trip every year! Great tips! I haven’t seen a post on this topic. Thanks! I’m an older parent, so it’s traveling after 50 for me, but I am very happy to have some strategies laid out before me so that I don’t get into trouble. The spending habits is a particularly good tip. Bon Voyage! Yes – different spending habits can really put a kink in things! EXCELLENT TIPS!! My husband and I went on a trip with another couple once and we were ready to kill them. Another tip is similar senses of urgency. Running to the plane, catching the very last ferry or train, sleeping in and scurrying to make breakfast, all of these do not spell vacation to me! I know – you can really enjoy people in one part of your life but find them absolute nightmares to travel with! Such great advice. Introvert that I am, I’m not a fan of doing things in groups, so I seldom travel with more than one other girlfriend. But these guidelines make it seem more doable–especially the tip that everyone doesn’t have to do everything together, and the one about scheduling some alone time every day. Thanks! I’m very selective on who I travel with. In fact, I have some great friends who I enjoy spending time with, but for one reason or another would NEVER travel with! I usually keep it to 2 ladies who I have traveled with frequently. We just do very well together and all have a great time! We haven’t traveled with friends since before we had kids and I do remember thinking that we couldn’t go away with just anyone. These are great tips. Joanne – we didn’t either when our kids were at home. We’ve only started traveling with friends in the last couple of years. Luckily, with the friends we travel with, we’re all on the same page. Glad you found the suggestions helpful!